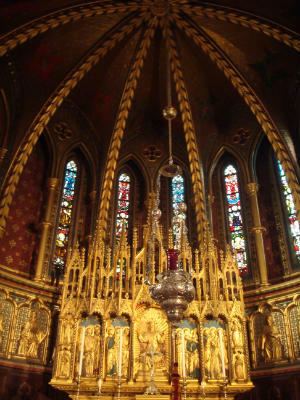 S. Augustine’s Church was consecrated on S. Matthias Day, 24 February 1880, by the Rt Revd John Jackson, Bishop of London. Described in a contemporary newspaper as 'the Minster of north west London', S. Augustine's was regarded as the grandest church in the diocese. The Service of Consecration began at 11.30am with a procession during which Psalm 24 was chanted; this was followed by Mattins and Antecommunion and an 'excellent if somewhat lengthy sermon from the Bishop on Christian unity'. Joining the vicar and his six assistant priests were the vicars of Paddington and Willesden, Dr West, Dr Attwood, the Reverends G Greenwood, C F Lowder, W H Cleaver, T O Marshall, H C Woodhead, A Gurney and many others. The collection amounted to £26 0s 4d. For many years the tower stood in an unfinished state but was finally crowned by the magnificent spire in 1898 when Fr Kirkpatrick (then in his seventy-fifth year!) was hoisted to the giddy height of 240 feet on a small platform in order to lay and bless the top stone.